Today’s bag was quite impressive. I could barely carry it to my car! 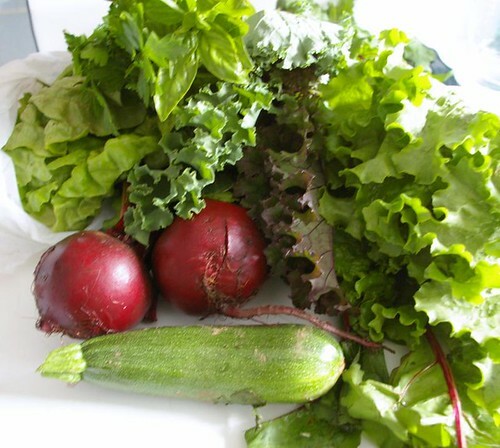 I received some lettuce, zucchini, parsley, kale, rhubarb, cucumber, carrots, radishes, and some beans. I also received not 6, not 8 but 12 ears of corn! I didn’t do much cooking tonight though, it was just too hot! 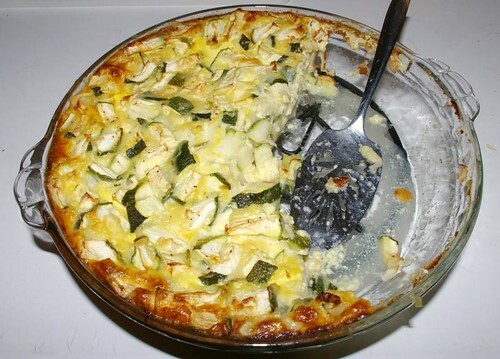 I did cook the pattypan squash from last week and the zucchini from this week though. I made the Simple Scallop Squash Recipe from here. It was quite good! 6 weeks into the CSA, all I can say is that it’s really interesting and I’ve never eaten so well! 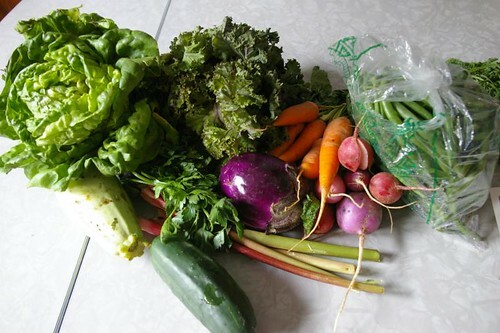 It’s awesome getting all these fresh vegetables and challenging myself to finding recipes for all of them. I think this used to be a knitting blog, right? Don’t despair, there has been some knitting. I’ve been working diligently on my Milkweed shawl and am almost done. I should have it done by the weekend! 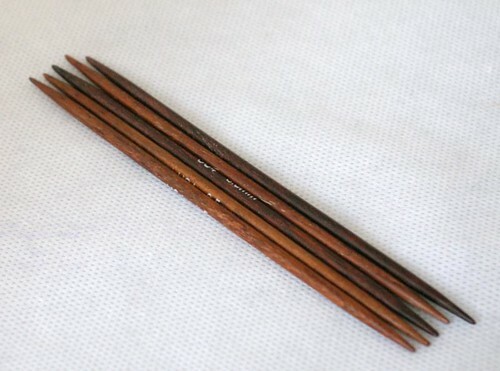 I guess it helps to be knitting on only one project! The other day, as I was going through my 100+ sewing/quilting blogs in my reader, I came across info about the 7th installment of the Doll Quilt Swap. I’d been tempted before but the timing was never right to be able to sign up but this time sign ups were just beginning so I was able to get in. I’d loved seeing other people’s doll quilts before and I thought that it would be fun to try. 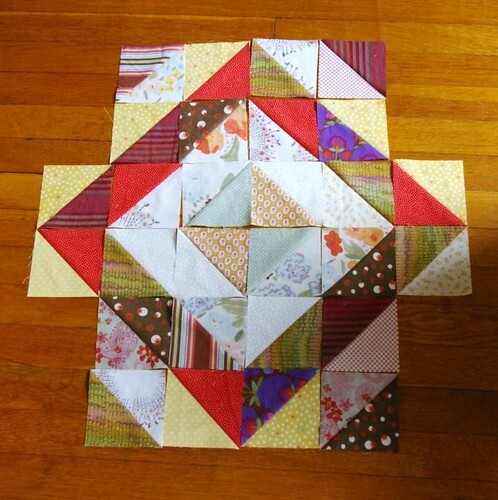 I’m already in a virtual quilting bee and that’s just the next step! This swap is a “blind” swap, which means that I know who I’m making a quilt for but she doesn’t know who is making one for her. To help out the person who will be making me a quilt, here’s a few of my favorites for inspiration. 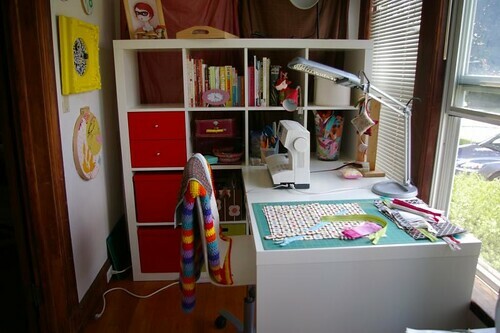 My tastes are very similar to comfortstitching and you should see her post right here. Her mosaic and her likes and dislikes are very much my tastes as well. I started working on the quilt for my partner. It’s been a bit difficult to decide what to do as she didn’t really specify colors or prints she liked and she does a lot of “art quilts” using techniques I am not really up to trying. She favorited a value quilt so I thought that I’d try something like that. I went through my fabrics this morning and after sorting some more with the help of Carol, I spent the afternoon cutting and sewing and this is what I’ve got so far. 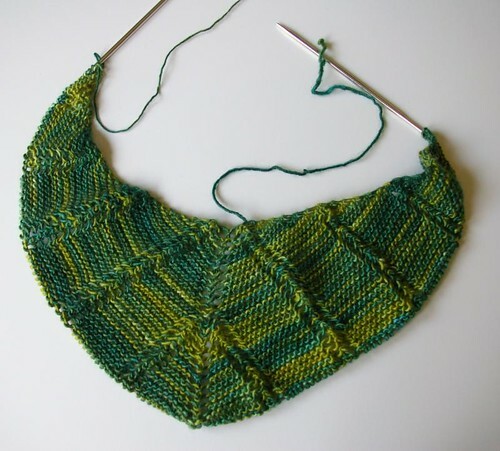 I quite like this, but it means I’ll need to make up a few more blocks. I’ll still play around with the placement of the blocks but I think it’s a good start. I tried other placements as well. If you’re so inspired and want to help me, the other pictures are right here. Alright, back to playing with my fabrics! I hope that you did not miss too much not having vegetable eye candy yesterday. For those who did, here it is a day late! 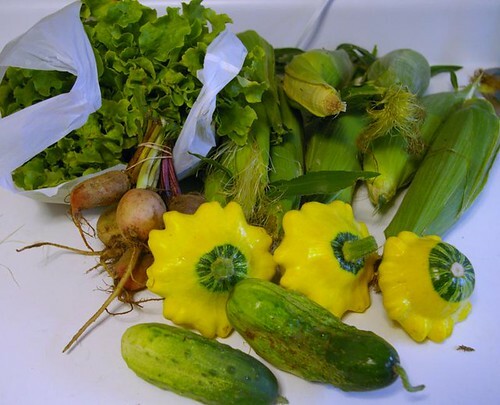 Some lollo lettuce, 8 ears of corn, some yellow, white and red beets, some patty pan squash and 2 pickling cucumbers. Promptly after arriving home I put some water to boil to cook the corn, heated up the oven to bake the beets and make some kale chips with last week’s kale. I used House on Hill’s Road’s kale chips as modified in this post. They were really good and DH and I gobbled them all. I definitely will be making more. It’s easy and a great way to eat kale! 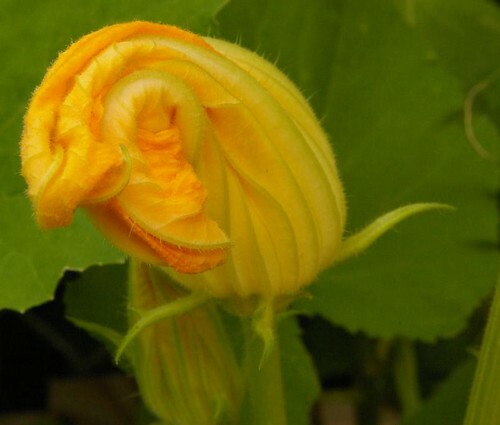 I have yet to decide how to prepare the patty pan squash but I do love to look at them! I completely stumped as to what to do with the pickling cucumbers. Anyone has a suggestion besides actually pickling them? Do they taste good raw??? My landlords have a little garden in our backyard where they’re growing tomatoes, herbs and various other unknowns. I went out today to get a few pictures. 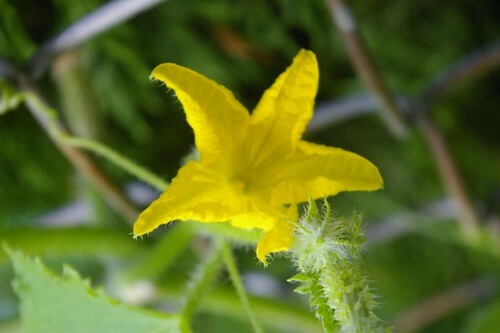 The beautiful zucchini flowers that were fully open a few days ago were gone due to heavy rains but there were still quite a few buds unfurling their petals. I also took photos of these flowers. I’m not sure what they are, but they sure were pretty. 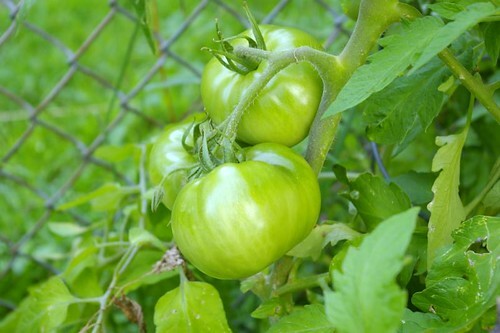 And here’s a study in greens of some future tasty tomatoes! 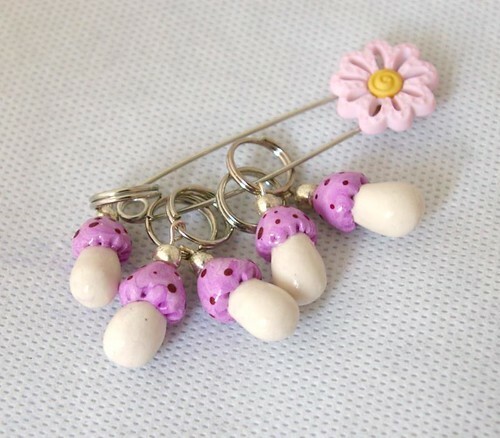 Cute mushroom stitch markers from Terrariooms on etsy. 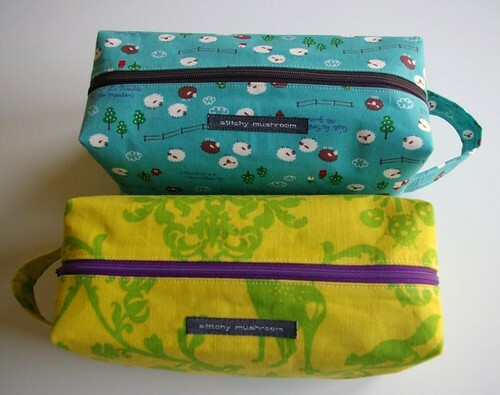 I bought these especially for future box bags with my favorite mushroom fabrics. I hope to have more made soon! A prize from from the June Play Yarn Dash, some really pretty dpns from Yarn Cloud. I’ve been playing this since the beginning, and it’s fun! You discover new online stores and there are some cool prizes you can win! A finished Strips and Bricks quilt top. 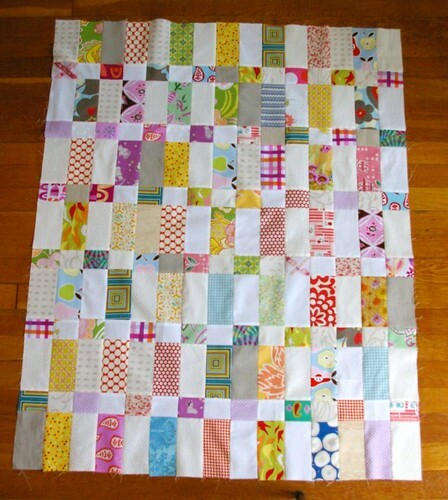 Since this picture I’ve created the quilt sandwich and next weekend I hope to start the quilting on it. The quilting on it is going to be so much easier because of my last item on my list of things that make me happy this Monday. I was going to post today about my UFOs, but I think that this post is going to be more fun! This morning I met with my dear friend Carol for a coffee and she had the most amazing present for me! 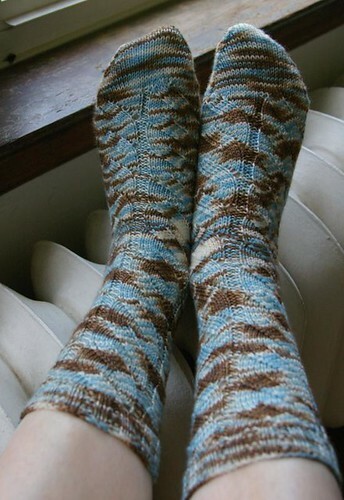 She made me a pair of socks, for me! About 2 months ago she was working on a pair of Nutkins for herself, the first sock was coming out too small so she had me try it on, and it fit me perfectly. So she decided that she’d make them for me for my birthday! Fast forward to today and now they’re mine! Aren’t they lovely? And they fit me so well too, like they were made to fit me and only me! I’m a very lucky girl to have such a wonderful friend. Thank you Carol! If this non-summer we’ve been having lately continues, I’ll be able to wear them soon! 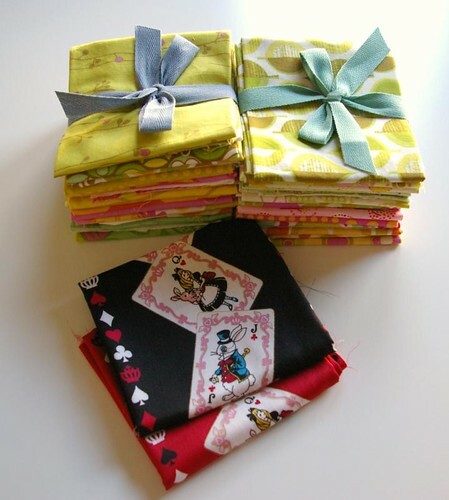 There’s over 20 Erin McMorris Wildwood fat quarters plus 2 pieces of fun Alice in Wonderland fabric. 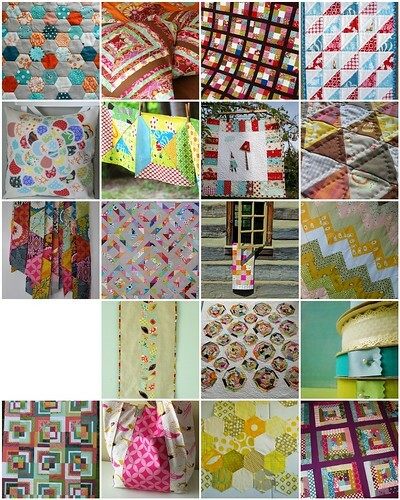 Wildwood is a great collection and will make a great quilt one day. I cast on last weekend for Cosmicpluto’s Milkweed shawl and it’s going along quite well. It’s still small enough that it doesn’t take very long for each row. I try to do at least a row every day and more when I can. I’m using HandMaiden Mini Maiden for the yarn and wow, that’s a gorgeous yarn to work with. The finished shawl is going to be a pleasure to wear. Last but not least, I’m happy that my sewing machine is finally operational again, and I was able to finish 2 box bags this morning. I’ll be finishing up a few more over the weekend! It’s good to be able to sew again. Of course, the fact that today is Friday and that I’m enjoying my early weekend makes me happy too. Today’s pickup was more bountiful than the last weeks and is going to provide for lots of tasty meals. We got a zucchini, 2 beets with lots of beet greens, 2 lettuces, some kale and some parsley and super yummy smelling basil. We can also go pick more peas, strawberries and now in season raspberries. Although, from our experience this past Sunday picking our share of strawberries and peas, there isn’t much left of both of these! The recommended recipe tonight was a beet and greens salad. The beets were cooked in the oven at 350 degrees for about an hour until they were tender. 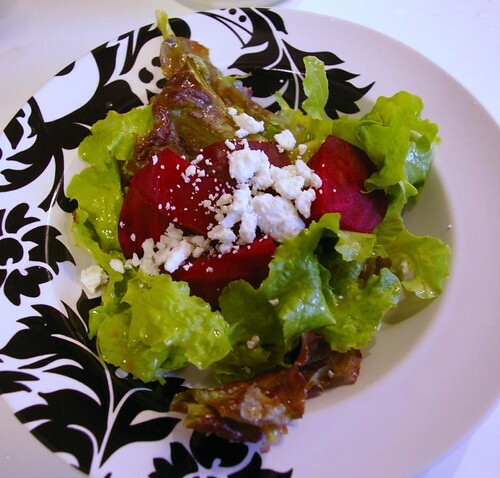 I peeled and quartered one beet and laid it on already dressed salad greens and then sprinkled it with crumbled feta cheese (the recipe called for goat cheese but I didn’t have any). This last Sunday, DH invented a very tasty lemonade and I made more tonight to go with our supper. I’m sure this lemonade has been done many, many times before but it was a first for us, and maybe also for you! I use the recipe on the back of my bottle of lemon juice for the basic lemonade (1 cup sugar, 1 cup lemon juice for 2 quarts water) and then add raspberries and chopped up strawberries. 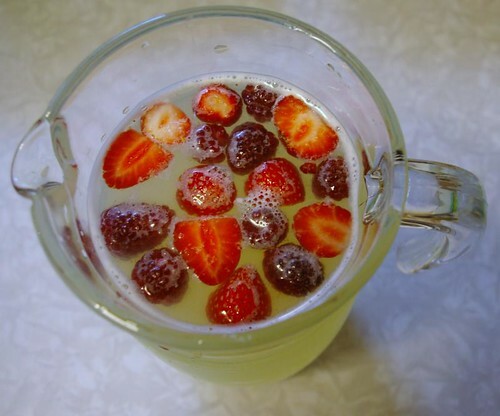 It’s a really refreshing drink and the raspberries and strawberries add a nice extra to the basic lemonade. I’ll definitely be making more! Last but not least, we had a very tasty dessert of fresh berries over greek yogurt with a drizzle of honey. I used some of the strawberries and raspberries that we picked on Sunday and added some store bought blueberries. Yummy! 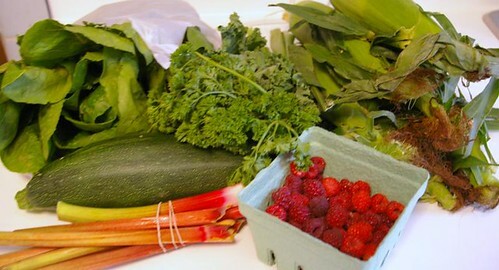 Later this week, I hope to cook up the kale and beet greens into something delicious, I’ll keep you posted! Sewing machine ETA: I brought my sewing machine at my local sewing store (were I bought my machine) and dropped it off so it could be looked at later that day. After a $60 repair it is now back home and I am very, very glad.